Today, we woke up after a night of stream-based celebration to find that the crowdfund not only passed the initial goal (436k), but is well on its way to reach the first stretch goal. Have we told you guys that you’re awesome? ‘Cause you’re pretty horn-tootin’ awesome. We have about 61 hours left on the counter, so let’s keep on making Them’s Fightin’ Herds even more of a reality! 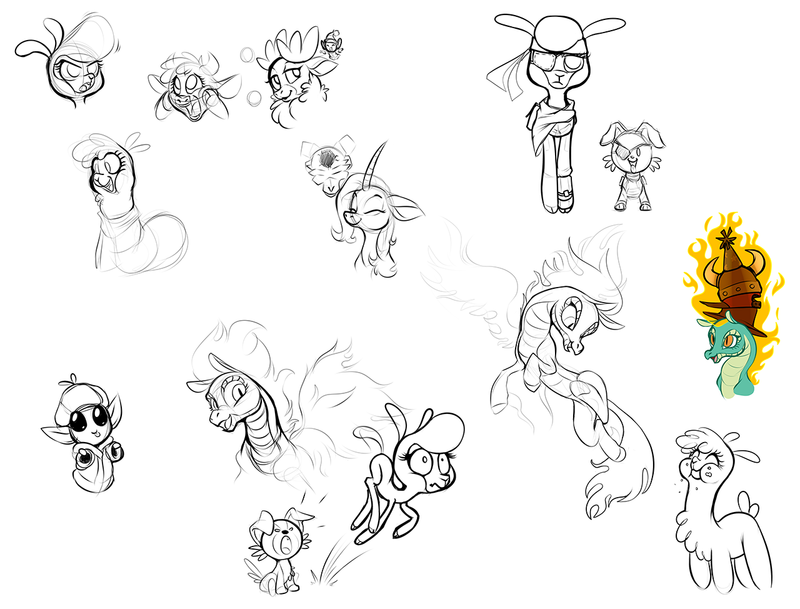 As some of you know, we had an impromptu Celebratory stream last night in Twitch, with most of the team present on the mic, including our character designer Lauren Faust. It was a blast, and we’d like to thank everyone that joined us there! – And for those of you that unfortunately missed it, worry not, for here’s the recording up on youtube. 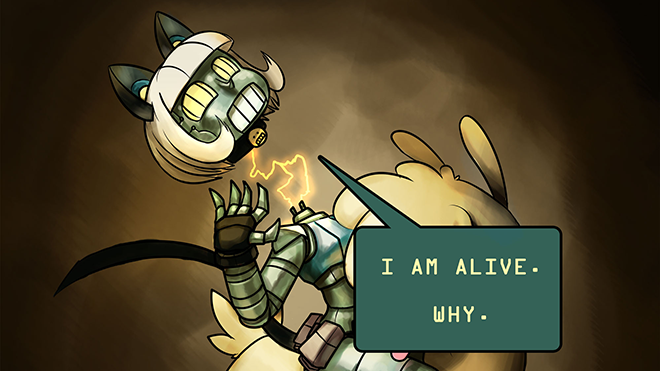 No gameplay showcase this time, we’re afraid, what with it being a completely unplanned stream, but you can watch Omari draw some TFH stuff while the rest of the team answers questions and hangs out with the stream. So what is next? ; Lots of work, that’s what! – Once the crowdfund reaches deadline, we’ll be looking into delivering the backers’ wallpaper sets and setting up the forums, and full-time work on Them’s Fightin’ Herds will begin, starting our circa 18 months development cycle towards first game release. We’ll of course be keeping everyone up to date on the particulars, to have constant update schedule and a stream schedule as well! ; We’ll need to find a balance for these streams, since we’d also like to dedicate most of the time available for development proper, but bi-weekly or monthly streams are sounding like a good starting point for now. We’ll see! 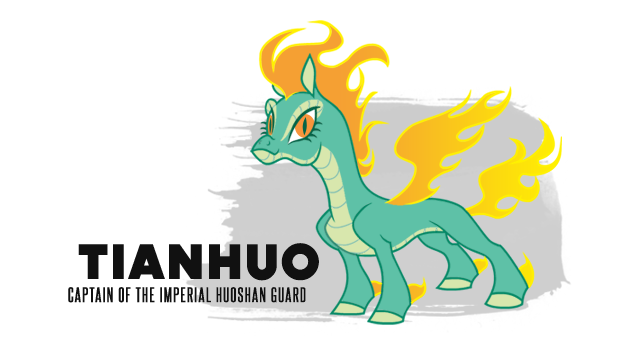 We also still have three Book of Lore entries to deliver (Paprika, Pom and Tianhuo, in that order), so keep an eye out on the site for the next character’s backstory, as written by Lauren Faust. We can’t say this enough times: THANK YOU FOR YOUR CONTINUED SUPPORT on making Them’s Fightin’ Herds a reality. We love you all. https://www.mane6.com/wp-content/uploads/2015/10/GameFundedHeader.png 250 640 Mane6 DevTeam https://www.mane6.com/wp-content/uploads/2016/01/M6V3-BlackMid_Transparent.png Mane6 DevTeam2015-10-19 12:02:502017-07-17 19:37:26Can’t stop the Stampede! https://www.mane6.com/wp-content/uploads/2015/10/cpernqqpdn7knmkkxsa1.png 349 620 Mane6 DevTeam https://www.mane6.com/wp-content/uploads/2016/01/M6V3-BlackMid_Transparent.png Mane6 DevTeam2015-10-18 17:14:452017-07-17 19:37:26THEM'S FIGHTIN' HERDS CROWDFUND SUCCEED. We’re on the final stretch of the crowdfund now, with a bit under one week to go, and we’re nearly 80% of the way to the goal! If you’ve been holding onto your wallet for that last minute rush of adrenaline in making the goal mark, now it’s the time to throw it at your screen, or better yet, to click on the pledge button to help make Them’s Fightin’ Herds a reality and even get some nifty backer rewards in turn. To keep the ball rolling, we’d like to invite everyone to our fourth game/work progress livestream, where Omari will be working a bit more in the game, and Lauren will be making another appearance to answer questions and have a chat with Jay and the stream. This fourth stream will happen tomorrow, Friday October 16, at the usual time (4PM PT/7PM ET), in our twitch channel. Don’t miss it! Champion of Foenum Mk2 includes every unlimited reward, a doodle by Lauren Faust, the opportunity to have your original character to make it into the world by becoming a unique lobby sprite that only you can use, and a 13 inch, certified original, certified exclusive, certified plush toy of your favourite Them’s Fightin’ Herds character, made by buttercupbabyppg. There are 3 of these bundles available, and this tier will NOT be restocked again (since there’s just so much time and effort that can be made to manufacture the plushes in time and with the superb quality she’s known for! ), so if you were waiting to make your move getting one of the Mk1 plushes, and were just a teeny bit late, this is your chance! Grab them now before they’re gone! Custodian of Worlds Mk2 is the ultimate pledge reward. 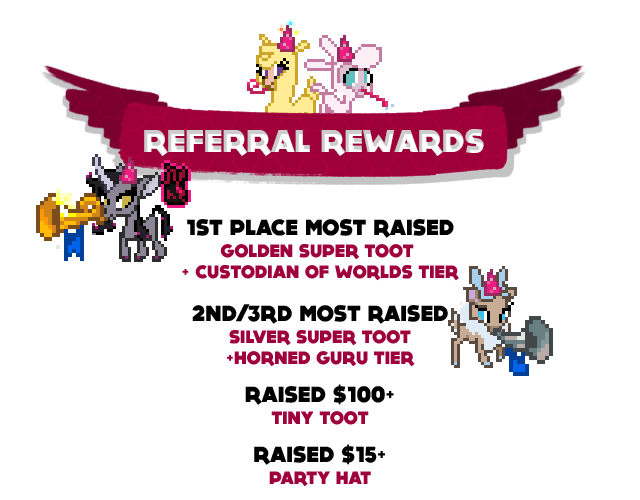 Every unlimited reward is available in this pack, as are all the limited digital rewards (create an accessory and palette, get your original character as a background character and a unique lobby sprite, and a Lauren Faust doodle), and a personal, good-for-one-person invite to a chat with Mane6 (including Lauren Faust! ), and a digitally-colored sketch of your favourite TFH ungulate (or your OC ungulateified to fit in TFH) made by Lauren Faust. 6 of these bundles are available, and much like Champion of Foenum, will NOT be restocked once they’re gone, so pledge now! Edit: Stream over!, youtube upload is done. Dance webms and Lobby PNGs now up! 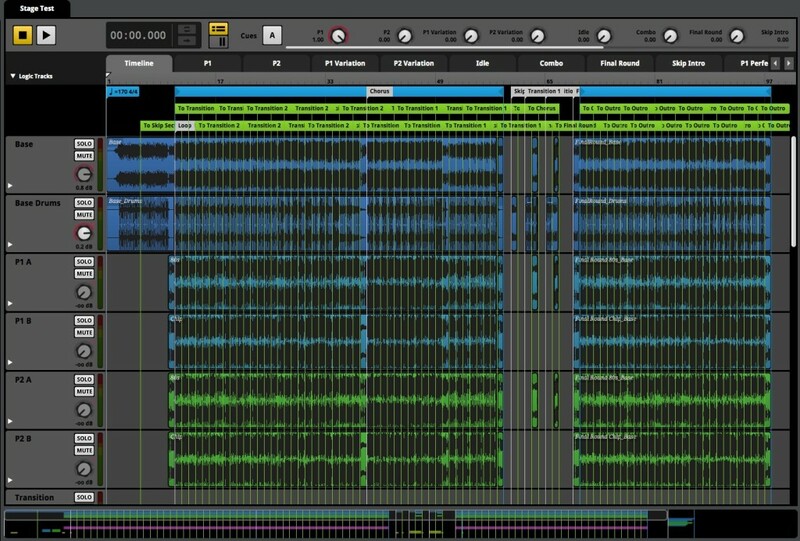 Jay and Omari are currently streaming some work progress, come join the chat! Edit 2: And the recording is now up on youtube! Edit: Stream over, thanks for joining! We’re live now, we’re showing some gameplay/work progress, and Lauren’s having a chat with the stream!, come join us! Go team! We’ve now smashed the 250k barrier! 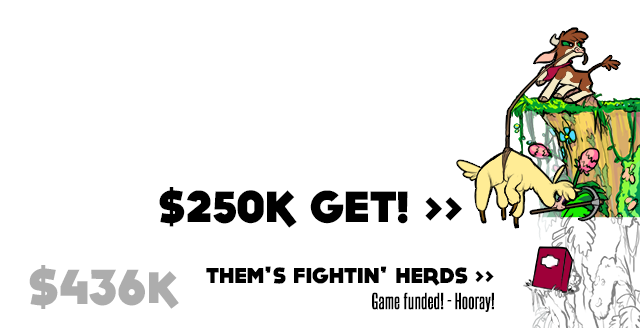 We’re nearly 60% there, and on the way to make Them’s Fightin’ Herds a reality! Of course, there’s still a ways to go, so let’s keep on spreading the word. Remember, we have prizes for the people who bring in the most in referred pledges to the campaign! To refer your friends, just log in to your IGG account, go to our crowdfund page, and use the unique links provided in the left side of the screen to help spread the word. And to keep in the spirit of crowdfunding and progress, we’d like to announce our second stream. The next Them’s Fightin’ Herds game/work progress stream will be on Saturday Oct 10, same ungulate-channel, same ungulate-time. (4PM PT/7PM ET). We’ll be showing a bit more game progress, working on the game’s art/mechanics pipeline, and Lauren will be comin’ in for a spell to answer some questions and have a chat with the stream! Don’t miss it! 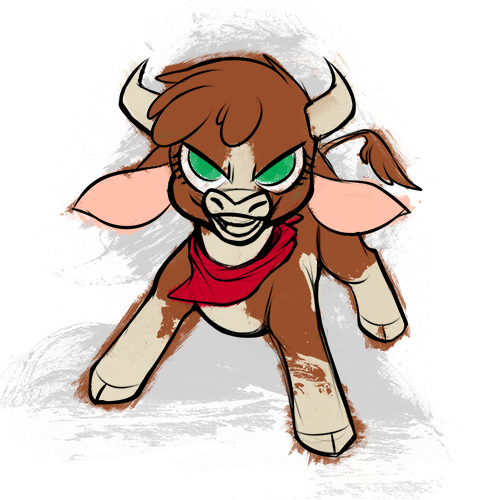 The next Book of Lore update will also be happening tomorrow, with a short prose story by Lauren Faust about Cattlekind and Arizona’s pre-game background. We had a bit of an event at Xanadu during their last monthly to showcase the game’s progress and let the locals have a bit of an early test of our current build. Here’s a small featurette with some of their first impressions on Them’s Fightin’ Herds. Also, to clarify a couple things we’ve been seeing lately, here’s a mini Frequently Axed Questions. Q. Now that you’re greenlit, when is the beta happening? A: We don’t have a specific date set. It will still depend on the crowdfund being a success and our development schedule being set in stone. Q4 2016 seems like a rough estimate, but no promises this early in development. Q. Will the game have Early Access on Steam? A: Nope. We do not feel that an Early Access period would be of much benefit to Them’s Fightin’ Herds, so it’s not currently in our plans. If you’d like to help us test the game ahead of release and have a peek at our progress, our Backers Beta is your best option, which is in the Guardian Sheepdog ($40) tier or greater! 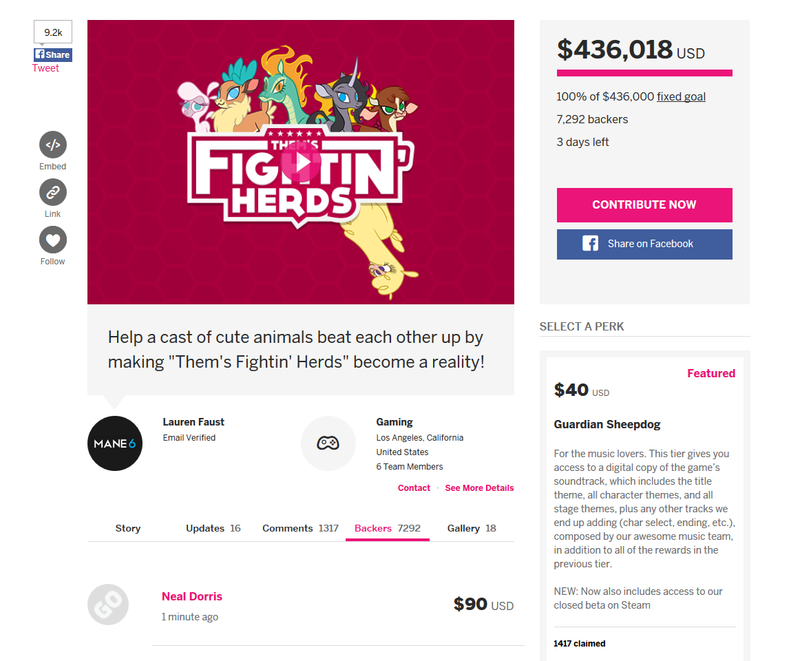 Once again, thanks to everyone for your support and let’s continue makin’ Them’s Fightin’ Herds a reality! 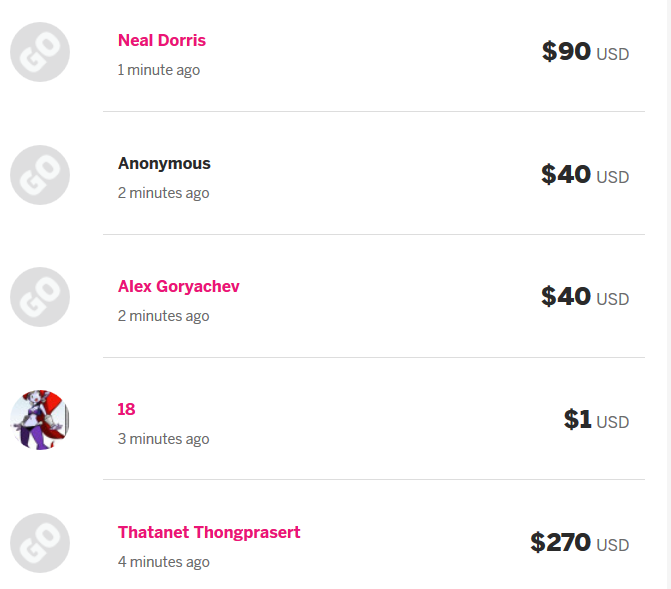 You guys are SO awesome, that most of the limited-tier rewards ran out in ONE DAY. That’s plenty awesome! But since there are still people out there wanting to get in on the four-legged ungulate-behind kicking action, we took a look at our pledge tiers and managed to squeeze in a few additional bundles and a couple new tiers for you guys to pledge at! The Spirit of the Plains pledge reward tier includes all the rewards from the Guardian Sheepdog tier, and also includes a new perk: A new, unique in-game flair (which shows on your portrait/character name while in a fight) and a lobby accessory pack to start your adventures in Fœnum in style! With this update, all backer tiers from Spirit of the Plains and above will be receiving the new, unique in-game flair and lobby accessory pack! If you’ve already pledged to any tier over $55, you don’t need to do anything, since this stuff is already included (and remember that you can upgrade your pledge at any time and select the upgraded backer rewards!). Cattlekind Pioneer is a new digital-only pledge reward tier. It includes all of the unlimited digital rewards (wallpapers, backer credit, backer palette, digital gallery, in-game flair, and the Complete Recordings Edition of the soundtrack), and adds extra perks to it. With the Cattlekind Pioneer pledge tier, you can get your OC as a lobby sprite, create a unique lobby accessory and , and you can create a palette for your favourite Them’s Fightin’ Herds character. This tier is limited to 36 bundles, and it’s digital only. No shipping required! We’re also opening up another batch of the Winter Sprite (+18 bundles), Reindeer Viking (+18 bundles), Horned Guru (+8 bundles), and Huoshan Captain (+8 bundles) as well. So if you’d like in on those, act fast, cause they might be gone before soon! 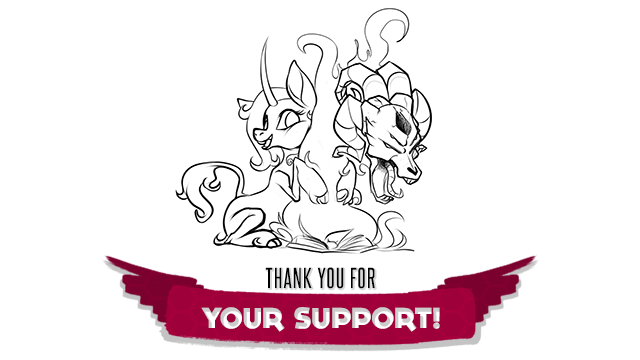 We’re adding a new reward to ALL of the limited tiers $250 and over: a small, quick doodle by Lauren Faust! We’re also upgrading the detailed sketch reward in the Custodian of Worlds tier to a colored sketch. Some of the higher end tiers don’t mention it specifically on the sidebar but rest assured the doodle is included. As a reminder, be sure to read the legal caveat regarding custom content at the end of the backer rewards. Don’t forget to tell your friends and family about the crowdfund campaign and our greenlight one too! – The social media icons in the side of the screen will help you spread the word. It’s time to kick this thing into high gear, and we have just the Key Keeper to help. She’s the fastest and most furious in Fœnum and we can’t wait to get to working on her. She stylishly completes our initial roster of six champions, so let’s go! Introducing the badass Longma, Tianhuo! For certain she is an intimidating sight, emitting stoic confidence, but not a hint of arrogance. She has no disdain for her opponents. In fact, she greatly admires skill and strength and cannot enjoy a duel unless she faces a combatant who offers her a challenge… and it takes quite a combatant to stand up to her bat-winged, aerial attacks or the force of fire she is able to magically conjure when she reaches her greatest speeds. Indeed, not many are even able to get past the daggers that shoot from her fiery, dragon eyes when she stares you down. No one is more disciplined, no one more determined, and even the Predators’ Champion should beware. Flight-based attacks keep your opponent’s head in the clouds! 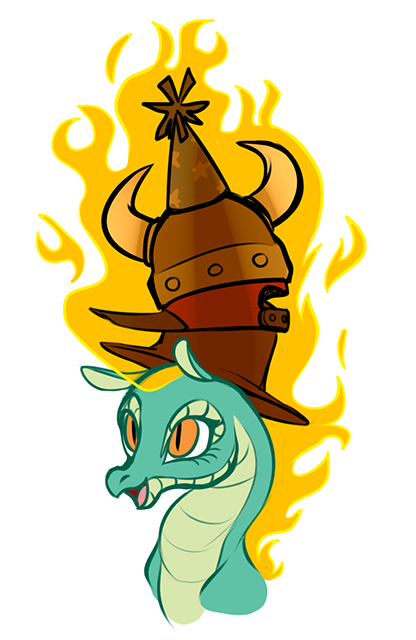 Cancel any and all of your attacks into her Firecracker Magic attack to overwhelm your opponents, or use it to move quickly across the stage. And here we go! Our Greenlight campaign is live. For those of you who’re not quite sure what Greenlight is, here’s a short explanation. Greenlight is the method that indie games (such as ours) must go through in order to get self-published in the Steam platform. If you have a publisher, you get to skip this step, but since we’re 100% indie, we need to go through it. What Greenlight does is puts the vote up to the steam community on which games should be going up on Steam. 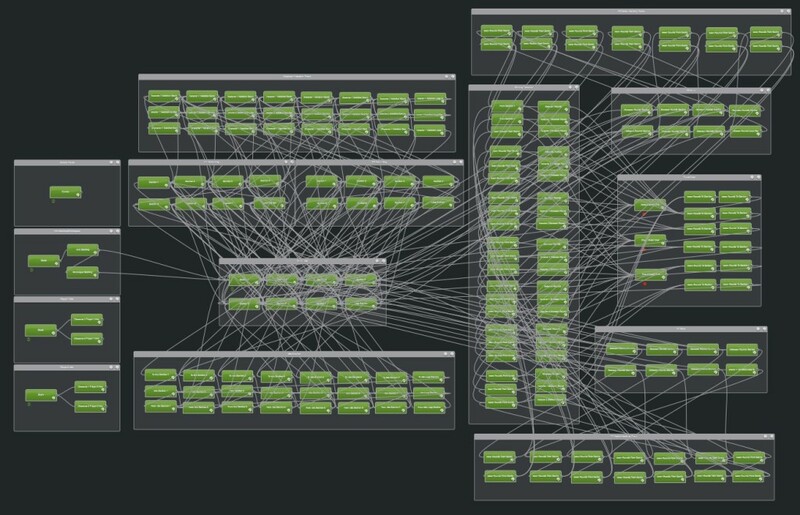 Once your Greenlight campaign has garnered a certain amount of interest, you’re allowed to publish your game on Steam, which, for us, would be a really good thing. Not only would this make the distribution of digital keys easier, it would also mean we get to use Steamworks, which would allow us to distribute the game keys and the in-game rewards more easily, to add achievements, improve on the graphical lobby’s infrastructure, make updating and patching the game a lot smoother, and, very importantly, it would allow us to do a closed beta testing period for the backers of Them’s Fightin’ Herds. If we do make it on Steam, everyone who has pledged, or pledges from then on to the Early Settler tiers and above will receive their digital key via Steam. Backers on the Guardian Sheepdog and above pledge tiers would also get an invite to participate in a closed, backers-only beta testing period for Them’s Fightin’ Herds prior to the game’s launch. So here’s where everyone comes in. By going to the link in here, and responding to yes to the “Would you play this game if it were available in Steam?” let’s the folks at Valve know you’re interested in the game getting released through Steam. Once it reaches a certain amount of exposure, as mentioned above, we’ll be allowed to publish through Steam, so if you want to see it happen, please consider helping us there! The crowdfund campaign‘s already over 27% funded, in only two days, but we still have quite a ways to go!, please help us by spreading the word, telling all your friends and using the social media link buttons in the campaign. 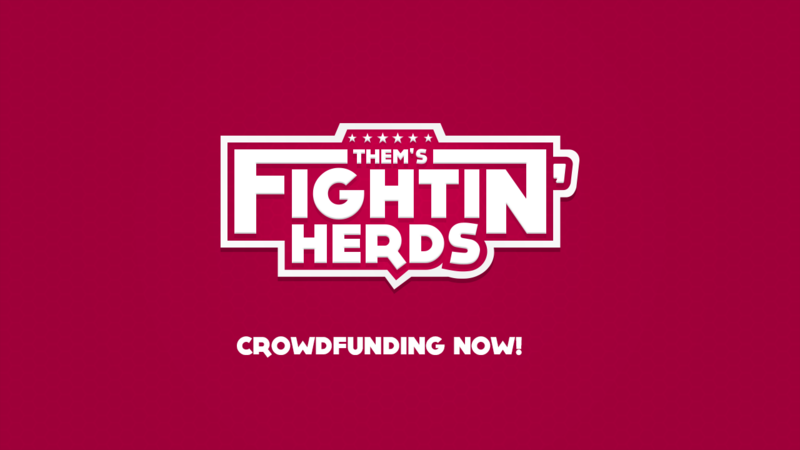 Them’s Fightin’ Herds crowdfund campaign will go live tomorrow (that’s September 21), at 9AM EST, which is in just a bit under 12 hours from this post. Then the game will be going on steam greenlight soon after that, so set your alarm clocks! We’re pretty excited to finally get the crowdfund going, and we hope we can count on your support, both by pledging to the campaign and spreading the word about it. And for those of you pledging, we’ll have some great backer rewards. We have some digital stuff, some physical stuff, and some pretty exclusive limited stuff for the higher tiers, including original sketches by Lauren Faust! And to get in on the crowdfunding move, have a video of some raw gameplay as it currently stands in the game. It’s been one wild ride so far, and we’re thankful to have you all supporting our project, but there’s still a ways to go, so let’s get the campaign rolling, and make Them’s Fightin’ Herds a reality! Has it really been one year since we started this project already? Well, technically it’s one year in February (or April), depending on when you start counting, but let’s pretend it has been one year for now, shall we? Back in February 2013, our first project, “Fighting is Magic”, got shut down due to legal circumstances already known to you guys, and which we won’t be going into right now. 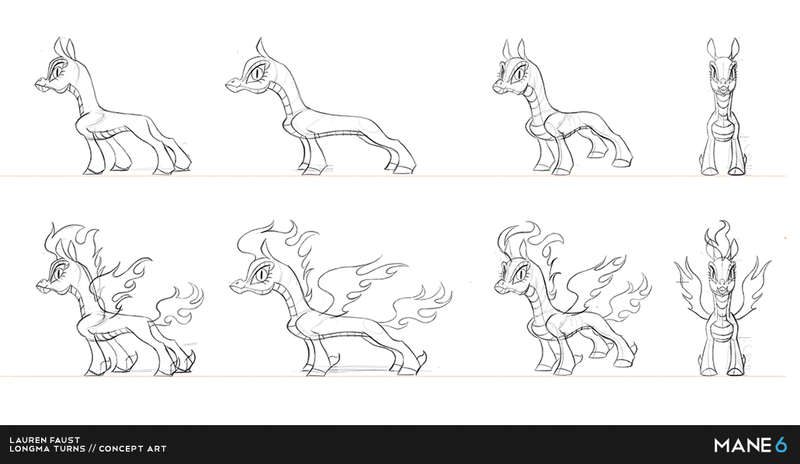 In March, we announced a new member joining the Mane 6 Devteam for our second project, a 2D fighting game that’d keep the basic foundations of what was Fighting is Magic, improve on the details, and feature an all-new, all-original new cast and universe, as designed by our newest Core Dev character designer, Lauren Faust, and the rest of Mane6. A few days later, we announced a proposed deal with LabZero, in which, if their crowdfunding campaign reached $725k, we’d get to use their game engine. By April, we had secured use of it thanks to the donations of all people that contributed to the LabZero crowdfund (Thank you!). Since then, we have been working on the project’s pre-production stage, inspecting the foundation and getting the raw materials we required to get production going, namely, characters and universe design. Here’s what has come out of it, so far.